When you need a professional and trustworthy cleaning service, you'll find that Sears Maid Services is just what you are looking for. Our teams provide a variety of services that cover any cleaning needs, from residential to commercial. Tired of cleaning the house every weekend? Sears Maid Services do it for you on a schedule that suits your needs. Moving into a new commercial space? We can give it a thorough and deep cleaning before you start unpacking and keep it clean on a regular basis. While we clean the routine problems of dust and tracked-in dirt with ease, we also tackle those awkward spots such as ovens, microwaves, and sunken bathtubs. We'll even go after those hard-to-reach ceiling fans! Give us a call at (631) 382-5066. 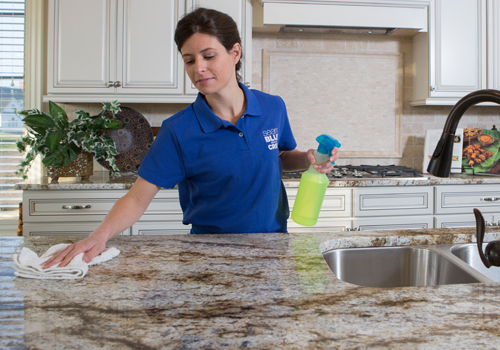 Sears Maid Services will keep your home clean and sparkling. Our teams offer weekly, bi-weekly, and monthly services and we'll work around your busy schedule. We clean every type of home. Whether you have a large house or a small apartment, we arrive on time and stay until the job is done. For those one-time deep-cleaning needs, we offer an intensive Deep Cleaning Service that adds extra attention to those areas that need a thorough cleaning only once or twice a year. We work with you to identify your particular needs for each deep-cleaning visit. In business, presentation is everything, so don't neglect your commercial or office space. What customers see first forms a lasting impression. Even if your clients never see your office, your employees do, and their work environment affects their productivity. A bright and clean workspace contributes to efficiency and allows your staff to feel pride in their work. Yet it's difficult to find the time to keep even a small office space clean. Let us help you. Sears Maid Services will send our professional teams to your commercial space on a schedule that suits your needs. We'll keep your employee bathrooms clean and fresh, sanitize the kitchen, and even empty the waste baskets. And of course, our teams will sweep, vacuum, and dust on a regular basis. There's no getting around it. Construction work is dirty. That's why Sears Maid Services extends its professional expertise to the business of cleaning up after the project is complete. We take our usual deep-cleaning service a step or two further to beyond the thorough job of regular cleaning. Our teams will sweep, vacuum, and mop all floors and carpets as well as dust, wash, and sanitize all surfaces. We'll make sure the bathrooms sparkle and kitchen countertops gleam. When we're through, any remaining dust or silicon will be eliminated. We recognize that it isn't always easy to let strangers into your home to clean. More than most other types of home services, cleaning teams have access to the private areas of your home, so you need to be sure that your cleaners are trustworthy. That's why Sears Maid Services puts each member of our teams through a rigorous screening process before hiring. We run a thorough background check and look for any past instances of professional misconduct. Then, each and every new employee undergoes extensive training to master the skills required for the job. This process begins before our cleaner ever sets foot in your home or business and is augmented by on-the-job supervision by an experienced professional. We prepare our teams to provide the quality work that you expect. What if you're not satisfied? That happens occasionally, so we guarantee the work that Sears Maid Services provides. All you need to do is call within 24 hours of the completion of the job and we'll send an associate out to inspect the site. Any problems our inspector finds will be corrected promptly at no extra charge.